The backlash against the quarterback’s confident politics has deep roots. While the mainstream media spends much of their time pondering Carolina Panthers quarterback Cameron Newton’s shortcomings as athlete and man, something much more important is at stake. Something that is less visible and less acknowledged. The debate about Cam Newton is as much about race and masculinity as it is about the particulars of this young, oh so gifted, and vocal black athlete. It is a debate about who and what kind of person gets to represent the very embodiment of American manhood in our civic religion of pro-football. So what is the origin of such anger and vitriol? Some of the particulars seem obvious. What else could the diminishment of “boy” mean besides the boldest possible expression of racism? Contained within the word, like its more notorious six-letter counterpart, is the whole history of slavery, racial segregation, and black subordination. Whites in the Jim Crow South consistently denied African Americans the status of adulthood. The ritual of calling all black people by their first name, with even the very elderly confined to the permanent infantilized moniker of “boy,” or its female counterpart, “gal,”—with its ugly sexual subtext—enshrined white over black as everyday practice. So the clearly racist backlash against this young black Southern quarterback is essential to understanding the vicious, and very personal, attacks he faces. But it is not the only reason. After all, there have been other black quarterbacks. There was, for example, Warren Moon, who went undrafted in 1978, and spent years playing in Canada while many of his white and arguably less talented counterparts made their names in the NFL, or Doug Williams, the first black starting quarterback to win a Super Bowl, in 1988. And of course, there are the growing ranks of a younger generation, including Russell Wilson, Robert Griffin III, Michael Vick and Donovan McNabb, who have also in various ways faced public scrutiny. It seems that every recent Super Bowl comes with a ritual debasement of a black player, be it working-class Oakland native Marshawn Lynch, or Stanford alumnae Richard Sherman. But the sustained and unrelenting cruelty directed at Cam Newton is hard to understand without reflecting on the current historical moment in which his superstardom has emerged. The burden of history weighs heavily upon 26-year-old Cameron Newton. The Carolina Panthers quarterback’s triumphal season that led his team to a 15 and 1 season crowned by the Super Bowl coincides with an ascendant Black Power zeitgeist arguably at it highest tide since the early 1970s. The signs are everywhere, as are the anxieties about its penetration of the mainstream: black youth’s sustained protest in Ferguson and Baltimore in 2014; the creation of a whole new cadre of African-American protest organizations, from Black Lives Matter and BYP 100 to We Charge Genocide; mass actions by black students on campuses; and the ouster of Chicago Police Chief Garry F. McCarthy after the videotaped police shooting of Laquan McDonald circulated widely. By all measures, this is a time of epic black visibility, from San Francisco Bay Area’s Levi’s Stadium to the White House. For this reason, the politics of black self-assertion matters, as does its cultural reach. Young black college students protesting across the country are letting their hair go natural, because it is fashionable to once again be “one’s self.” Even Cosmopolitan and Time magazine have featured the founders of BLM, while Queen Bey is mining her Louisiana street cred and evoking the Black Panthers in fishnets and garter belt. The mainstream is mimicking the margin, as blackness and its many meanings emerge as matters of national contemplation. And it is precisely in this moment that the outspoken, charismatic—and let’s just be honest—physically beautiful Cameron Newton brings this battle to the realm of commercial sport, arguably an arena of contestation that many Americans care about more than any other. And this is not just any commercial sport, but the very position of quarterback itself, which has long been understood as the remote domain of white male mastery, leadership, and cerebral intent. This is serious business quite literally, as the quarterback is seen as the face of the team and the embodiment of its very brand. For African Americans, the symbolic meaning of Cam’s ascendance to this realm of exalted masculinity is profound. A recent Facebook posting captured how Newton, perhaps coincidentally, represents the historical convergence between the black radical spirit of the 1960s with our present moment. Unlike many of his predecessors in football, Cam Newton (not unlike the Black Panther whose surname he shares) does not enter the national stage quietly. He is forceful and expressive, and unwilling to bow to conformist expectations of the national media. He compares football passes to cooking collard greens and does not apologize for how he conjugates his verbs. Like the younger generation’s version of Black Power expressed musically by Compton native Kendrick Lamar, “He loves himself” and is thoroughly disoriented by the incessant demand that he must change. Disturbingly, in many circles, Newton’s self-regard is considered an unforgivable sin for a breathtakingly talented young black man of working-class origins, who remains true to his roots. The profound meaning and honesty of Newton’s statement eludes much of the reporting on him. It was easier, and less disturbing to brand it as hubris than to reckon with its deeper meaning. He is attempting not only to articulate the enormous pressure he faces as a young black quarterback to conform to the weight of a history in which blackness itself is seen as lesser and as antithetical to the very leadership position he has earned. In a larger sense he is also expressing what every African American who experiences social mobility knows—that the price of the ticket, as James Baldwin once said, is a degree of self-erasure: muting one’s speech, taking care to flatter others and to affirm what is considered in normative in the American mainstream, and so on… This can be a very painful and soul-destroying dance, and Cameron Newton is too proud to do it. He has grown up in the hearth of Atlanta’s black community, and one can’t help but feel that this is all new to him, and deeply heartrending. Nevertheless, what few will admit is that Cam Newton is utterly mesmerizing, even when he loses. His emotional expressiveness is compelling, because it reveals a deep honesty about how he moves through the world. Newton can’t help but show how he feels, and this is an intolerable truth in the anemic world of corporate-media branding. The intense backlash against him is not only racist but also an attempt to elevate a false, stoic, and corporate-friendly vision of masculinity à la Peyton Manning, Tom Brady, and Joe Montana. As Dave Zirin noted, Manning, a child of privilege, partial owner in Papa John’s Pizza, and large Republican donor, actually took time out from his career triumph to shill for Budweiser and his franchise. Is this how really we want men to act? To literally perform traditional masculinity for money and endorsements? 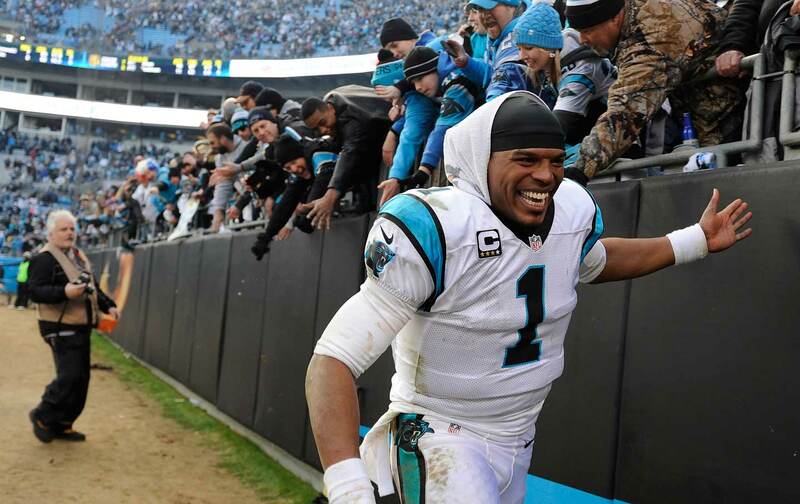 For better (not worse), Cameron Newton says no and insists on being himself. Donna MurchDonna Murch is an associate professor of history at Rutgers, and the author of Living for the City: Migration, Education, and the Rise of the Black Panther Party. She can be found on Twitter @murchnik.